There’s a line from the movie “Remember Me,” Our fingerprints never fade from the lives we touch. This month at the Chamber’s Business Expo on Friday, March 8th, several area businesses and non-profits will be featured who do just that – touch lives. The March Business Expo comes on the heels of a very successful Diversity program held last month by our Chamber. While we as a community and nation have made tremendous strides when it comes to race relations and gender over the last couple of decades, we still have a ways to go. 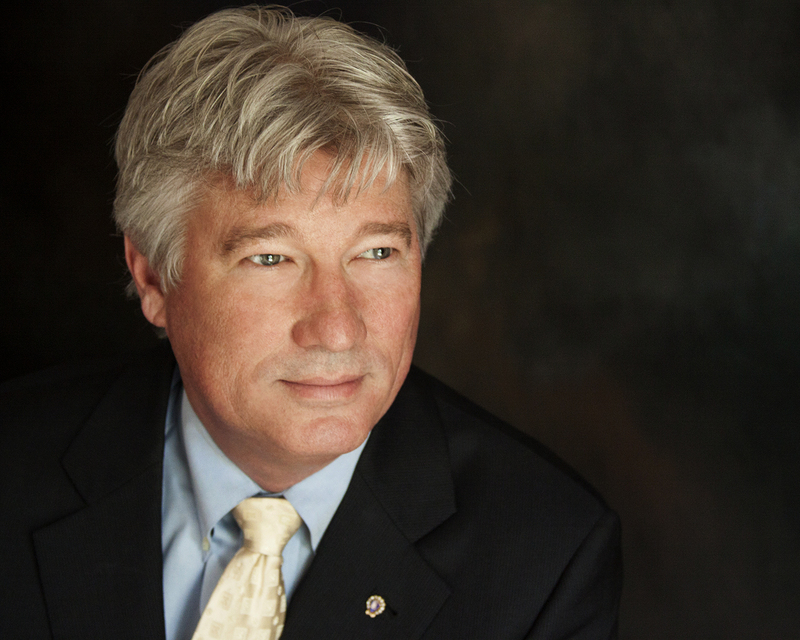 My first position with a chamber was in 1993 in St. George, SC. The population there was approximately 1,900 people at the time. Although equally populated between white and black citizens, the town faced an underlying tension between the races. Black and white children were not educated in the same schools for the most part with white children attending private schools and black children the public schools. In the fall of 1994, the County held a School Bond referendum to address needs within the public school system. It was not a popular action for the chamber to announce its support for the Bond. Many on the Chamber Board felt we should remain neutral. However, while not popular, it was simply the right thing to do. The Chamber’s support sent a strong message to the African American and Indian citizens and demonstrated that the Chamber felt strongly about our investment in the future. A few months later, the Rev Oscar Odom, who had been critical of the business community in the past, brought a man by our Chamber to meet with me. The gentleman introduced himself as Bill Smith – the father of two time NBA Champion and Houston Rocket Kenny Smith. Many of you may also recall Kenny was a former N.C. Tar Heel standout. Mr. Smith told me Kenny wanted to bring a basketball camp, already present in Houston and New York City to St. George. Though thrilled, I wasn’t sure why he would do that until Mr. Smith relayed how Kenny was raised in St. George with his grandparents and learned to play basketball on the school’s aging outdoor goals with their chain nets. Tri County Regional Chamber Chairman Robby Robbins receives a plaque of appreciation for hosting the first Kenny Smith Basketball Camp in St. George. with Bill Smith, Rev. Oscar Odom, Kenny Smith, and Bill Russell. The Chamber encouraged businesses to sponsor children who could not afford to attend and within weeks we had kids of all ages, backgrounds, and races attending the camp. I remember one child showing up in street shoes and Kenny looking over asking where were his sneakers? One of the campers then blurted out, “He’s not suppose to be here…he’s not even signed up!” The 8-year old looked completely dejected as Mr. Smith escorted him from the gym…. only to return minutes later in a brand new pair of Nike shoes and registered, compliments of Mr. Smith! 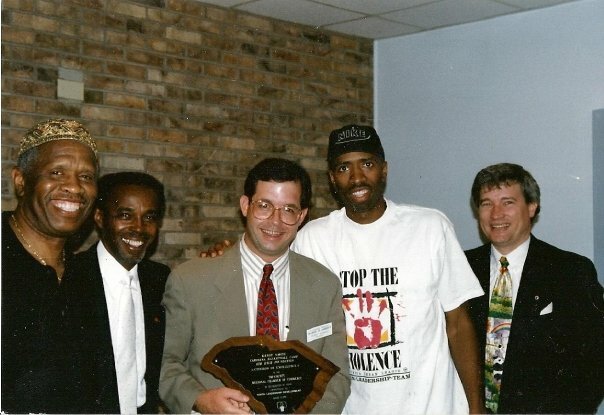 The Chamber and Kenny Smith’s Mile High Foundation worked closely together over the next few years until those nets were finally cut down and moved to Furman University where more kids could take advantage of a program which gave children an opportunity to avoid drugs, gangs, guns, and instead invest in a bright and promising future. I’ve often wondered what became of the little 8-year old boy whose life was perhaps changed by the generosity and vision of Bill and Kenny Smith. Not to mention the hundreds of other kids from St. George, Holly Hill and Harleyville. The stand that Chamber took on the school bonds and businesses sending those children to camp not only touched the lives of those kids – it changed the face of a community. Twenty years later our Chamber is working to raise the issue of diversity and to partner with service organizations whose missions are to improve the lives of our children and families. Our fingerprints never fade from the lives we touch and the lives we touch…never forget. The Lake Norman Business Expo – Our Version of Show and Tell! Nearly everyone has experienced “Show and Tell” whether it was when you were a student or perhaps assisting your child or relative with their homework. When I was a student at Finley Road Elementary School in Rock Hill (SC), I was asked to bring something or someone to school that week of significance to me to share with the rest of the class. I have never been accused of being overly humble, even as a child, and I decided the best person to bring to show off – was me! As the first-born child, my mother Sarah took great pains to detail every significant event of my childhood. My baby book was filled with photos, captions detailing the event, locks of hair, and special cards and mementos I can still recall taking the baby book down from the shelf and stripping many of the photos from the album and creating my own “Show and Tell” project. That week I shared with my classmates the most significant moments of my life displaying the photos my mother worked so hard to compile. Not satisfied with mom’s captions, I created new explanations for each photo, with my own creative and adventurous story. Much to my mother’s chagrin, those photos never made their way back to where they belonged, perhaps strewn across the playground some 46 years ago. Needless to say, she wasn’t at all happy with me about that. On Friday, March the 7th, more than 170 of our Chamber members have the opportunity to “Show and Tell” at the largest business trade show in the Charlotte market. 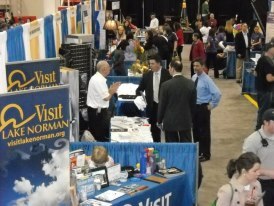 Our Lake Norman Business Expo is designed for businesses to tell their unique stories and showcase their business. If you are an exhibitor, no other venue can give you greater exposure and opportunity than the Expo. If you are not an exhibitor, please come out and see Business at its Best and support the lake’s retail and service businesses. By the way, my mother has always had the last word on the “Show and Tell” incident. At significant family gatherings, mom has reminded my brother and sister why their baby book was not as detailed as theirs. “It is because how bad your older brother was as a child. You have Billy to blame,” mom constantly reminds them on this and many other countless examples. I always respond that I was just breaking her in good for my future siblings. While my exercise was not what my teacher had in mind, the Lake Norman Business Expo is our business communities’ moment to shine. I encourage everyone to participate – sharing the event through your social media and word of mouth and I’ll see you at the Expo! For more information Visit the Lake Norman Chamber website or call the Chamber of Commerce at 704-892-1922. 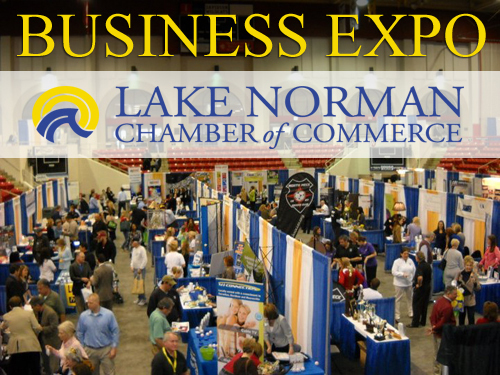 The Lake Norman Chamber Business Expo will take place at the Davidson College Belk Arena 200 Baker Drive in Davidson, NC 28036 on Friday, March 7th 11 am until 5 pm. There is no admission charge and the public is invited.